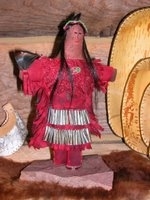 The Cattail Collection by Ramona Morrow is a collection of Native American dolls. Each doll is signed and numbered. The dolls are dyed muslin stuffed with cattail fluff. 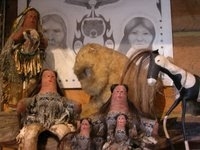 The horses and buffalo are made of leather and also stuffed with cattail fluff. Every four years Ramona donates one of her dolls to the new incoming President of the United States. To date she has donated four dolls. She recieved thank you's from Pres. Bush and from Pres. Obama. 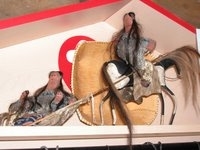 To date there are 182 of the dolls, 38 horses and 4 buffalo. In March of 2009, Ramona taught Native American doll making in New York at the Smithsonians National Museum of American Indian. She was invited back in the fall of 2011 for a Dream Catcher workshop. You can check out NMAI New York to see photos of her trip. 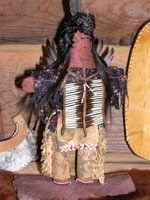 Ramona is a member if the IACA, Indian Arts and Crafts Association also. Ramona also sells these through The Dept. of Interior "Indian Craft Shop" in Washington, DC, and to West Southwest Gallery in Denver, CO. and A Shared Blanket also of Colorado. All the dolls are origional, there are never two alike, although some may be similar. 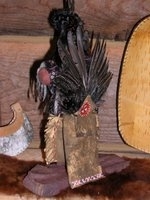 The Cattail Collection has many collectors throughout the US, British Columbia and now Austria.